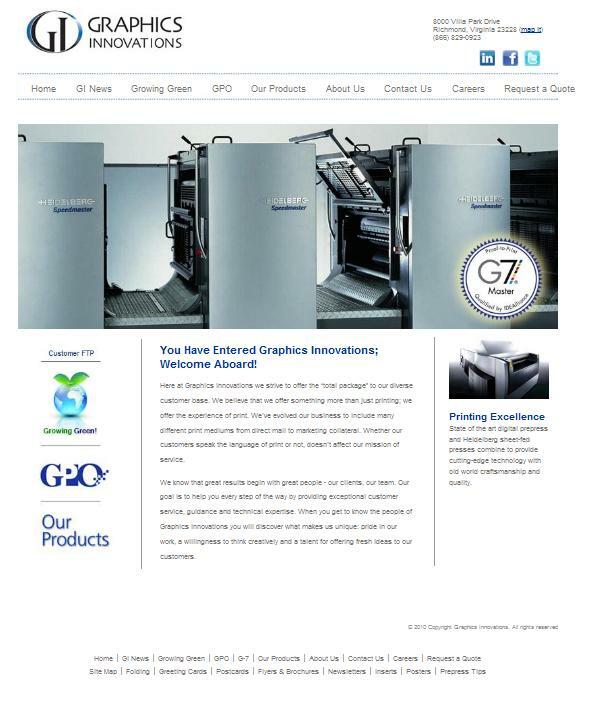 I’m delighted to announce the formal launch of our latest project for Graphics Innovations, a Virginia certified master printer. Designed internally, the new site expands on past content with the addition of help pages for FTP connections, pre-press tips and a how-to guide to preparing inDesign and Quark files for pain-free high quality printing. Architecture for news feeds, blogging and professional forums round out the new platform. The site also features a custom collections option, allowing the client to edit, expand, modify or change content without the need for in-house development expertise. The site is built on the Solertium Software GoGoEgo platform. Congrats to the entire GI team! This entry was posted in Projects, Teams and tagged launch, printing, projects. Bookmark the permalink.